Time to "sell in may and go away"? As a discussion point, I have shared a simple strategy that toggles between holding equity (I chose SPY for parity with Quantopian’s benchmark) for the months of October thru April and holding bonds (I chose BSV because I’m partial to Vanguard) for the ‘summer’ months of May thru September. Granted, this is an extremely simple, low frequency trade – yet it has been eerily on the mark the last few years. I’ve certainly seen historical studies that argue full equity exposure beats ‘market timing’ in the long run, but there also seems to be a compelling behavioral finance argument that ‘sell in may’ has become a self-fulfilling prophesy in recent years. Certainly it’s impossible to miss the seasonal spike in news coverage and online speculation. (side note: Google Trends search on “sell in may” is pretty entertaining). At very least long cycles like this seem like a good case for dynamically weighting multi-factor models and/or looking for underlying predictors (macro factors, VIX, news?) to help inform asset allocation strategies. I’d love to hear from the Quantopian community on how folks use/abuse/ or actively disbelieve in seasonality of market returns. That is fascinating. I'm going to have to check other months, now, and see if I can find other ones like this. It's a curve fit probably, but a very good one. It would be lovely to see automated, randomised choices of start and end dates, but a few particular choices of dates confirms the adage for as far back as Quantopian's data go, as far as I can see. The only time there was a problem was in Oct 2008; if you ignore that and imagine you would have stopped yourself from buying into a hugely down-trending market, results are beyond-ridiculous good. ...and these papers have decent coverage of this type of seasonality: http://papers.ssrn.com/sol3/papers.cfm?abstract_id=2138547 and http://papers.ssrn.com/sol3/papers.cfm?abstract_id=2115197 . It's a "go away", not "buy bonds" approach, but amazing how much holding power this one has. I've heard the adage a million times and like the results. But I'm curious does any one have any ideas of what is logically causing it to happen and where the flow of money goes? Who is taking money off the table in such a big way, could it be hedge fund traders heading out to the Hamptons? or is it really just an unexplainable phenomenon. i always thought it might correspond to year-end bonus season. depending on inudstry/position people get bonuses dec thru may. a corporate balance holds far less stock and more near-cash like investments than a retirement account. bonus season transfers money from corporate balance sheets to retirement accounts, so there is a net positive demand for stocks. as a caveat, i have done basically nothing to test this hypothesis. i have some ideas on how to, but have never gotten around to it. @Eric - there is no universally accepted consensus on the underpinnings of this 'seasonality effect' - also sometimes called the "Halloween indicator" - anymore than there is a consensus on whether it's fact or fiction. The two most commonly cited candidates that I've come across are seasonal variations in turnover volume and in AUM. (1) seasonality in trading volume - basically your Hamptons hypothesis (interesting academic paper from mid 00s on the idea investors are "gone fishin'" in summer months). This study did also make an attempt to back out retail vs. 'smart money' participants based on trade sizes to try to see what investor class specifically is backing off - but they didn't observe a marked difference there. (2) seasonality in investor flows - as @Scott suggests above - money flows into mutual funds are higher in Q1 driving demand and pricing in 9 months of expected returns in the first 3 months of the year. Turn of the month effect - institutional $ flows are higher at the start of month than end of month (micro version of 'sell in may') which drives outperformance in week 1 vs week 4 on a monthly basis. Instead of taking data all the way back, use a 10 year seasonal time frame and step it forward. Also, use best weeks in a year instead of months. The results should be better. The reason behind a 10 year (You can justify other time frames) is that the market is dynamic and seasonal trends do shift. @Anony Mole: why do you think the curve for Buy in May and Play in the Hay would be anything but terrible? @Anony Mole - the dates were different. I ran it again with the same dates (and initial captial) as before; you can see the benchmark returns are (almost ?!) the same. Remember this strategy is invested at different times than "Sell in May..." and that as returns are re-invested (in both), there is no perfect symmetry to be observed in the return graph. This is my favourite algo on this site. How would it stack up if it did a sell and walk away, instead of reinvest into bonds? May-Oct avg returns 1.15% ranks at the bottom ( 12/12) for any 6 months period. May-Ocy , if returns are positive averaged at 6.77% again ranks at the bottom ..
@Pallas, my mistake. I see it now! Also, I read somewhere that election years are more stimulating for the economy. I wonder how holding on to the S&P on election years would look. @Daniel, it's not entirely clear to me what logic you meant to express -- did you mean to only buy in October the year before an election year and sell in the May of the election year, or did you mean to buy in October and sell in may, but if the year is an election year don't change any positions (don't buy, don't sell, just stay in the market from the previous October's)? @Daniel I tried to implement your "sell in may (but not if it's an election year) and buy in october", and got almost the same numbers as you...it seems very good. 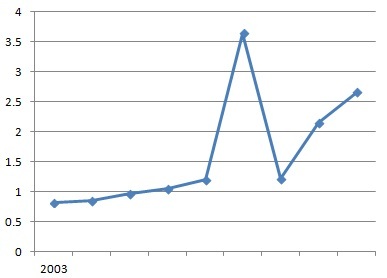 edit: Though, omitting 2008, the data show a progression in the ratio (i.e. the algorithm seems to be increasing every year). @Daniel - The efficient market hypothesis says this trend shouldn't exist, since it's quite predictable. I have a hunch your leverage may be out of control. @Spencer... just buy and hold apple... Total Returns 6067451648.8%... Max Draw down only 354.8% only.. $1000 initial capital. I have a friend that works for an investment firm and he said that their analysis showed that the 3rd year of a president's term exhibited market uptrend. His hypothesis , the candidate was doing everything possible to show that current administrative policies have had positives impact on current market conditions. However, no bets, on second term elections. Hope this helps.